Finally the last brigade of miniatures for the Vimy project are rolling off the line! This isn't the last of the Canadian Corps. I still have the 10th Brigade to paint, but as they took no part in the attack on the 9 April 1917, I'm not going to bother with them for now... I also have a lot of artillery pieces to paint up at some point. Not sure when they'd ever be used. I picked them up thinking if I had time, they'd have been fun to paint up and sit on a nearby table to show SOME element of the guns involved. The 27th Battalion (City of Winnipeg) was part of the 6th Canadian Infantry Brigade, 2nd Canadian Division. 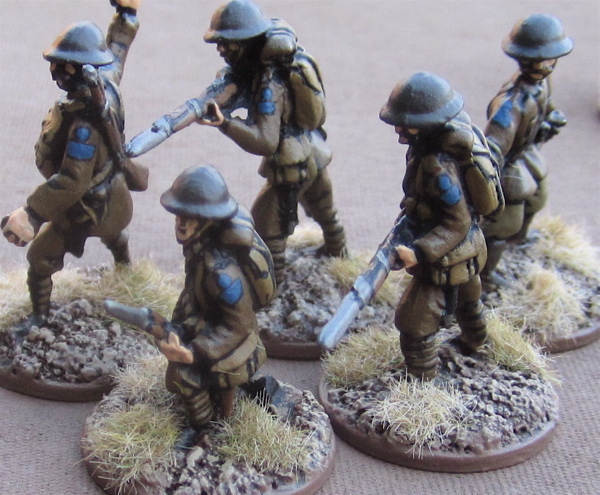 All ot the figures used for the 6th Brigade are from Irregular Miniatures. 27th Battalion (City of Winnipeg), CEF – figures from Irregular Miniatures. The formation patch for the 27th Battalion was a blue circle (blue for the junior brigade within the division and the circle for the senior battalion within the brigade) over the blue rectangle of the 2nd Division. A figure comparison of 28mm British/Canadian Great War infantry miniatures (now that I have samples from every manufacturer… I had hoped to do this today, but the lighting isn’t great (as evidenced by the crap photos above!) and it’s a bit nippier outside that I’s expected, so I may not get to it until tomorrow. Is that chap (3rd from the right) carrying a Lewis gun? I was expecting a larger ammo pan than he seems to have. Artillery would be decoration but it does serve a useful purpose on the battlefield. It helps remind players (and GMs for that matter) about resolving barrages. I will have explosion markers on the table marking where the barrages are landing! Nice work! So feet up and play some board games, oh yeah terrain! Good luck!